New, updated edition of an important and timely critique of Anti-Jewish sentiment on the left. There is a sickness at the heart of left-wing British politics, and in recent years it has silently spread, becoming ever more malignant. Today, it seems hard to believe that until the 1980s, the British left was broadly pro-Israel. And while Jeremy Corbyn’s leadership may have thrown a harsher spotlight on the crisis, it is by no means a recent phenomenon. The widening gulf between British Jews and the anti-Israel left, now allying itself with Islamist extremists who demand Israel’s destruction, did not happen overnight or by chance: political activists made it happen. This book reveals who they were, why they chose Palestine and how they sold their cause to the left. Based on new academic research, Dave Rich’s nuanced and thoughtful guide brings fresh insight to an increasingly fraught debate. 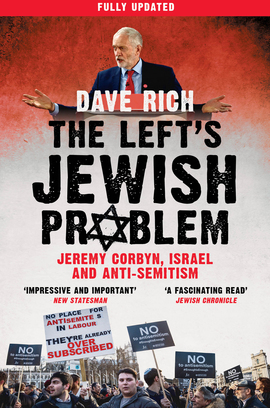 As the question becomes more urgent than ever, this new, fully updated edition, taking in events since 2016, provides an essential guide to the left’s increasingly controversial ‘Jewish problem’.